mmm! that looks wonderful! i love to eat my granola mixed into yogurt! it cuts the too sweet from the granola, and the too sour from the yogurt! Wendy, this is a great find, thank you for sharing. I’m intrigued to try this out. Love granola, but doesn’t all that sugar make your teeth hurt in the morning? Gorgeous shot – just delicious. I have similar issues – and my new breakfast favourite is birchermuesli. I posted a recipe on my blog a while ago, but I have since adapted it for my (also early) morning routine – so I either soak 1/2 c oats overnight with some berries (I use frozen summer berries) and a spoonful of maple syrup and then mix in grated apple and some 2% greek yoghurt in the morning, or I make it all the night before and just give it a good stir in the morning (sometimes some water comes out of the fruit over night). What could be quicker then a completely ready-made breakfast waiting for you in the fridge? Deana – Like the yogurt idea. May try it out! Joanna – Now, I tried something like this once and, though it was REALLY tasty, it was so cold I couldn’t stomach it first thing. My microwave is collecting dust in the garage so I can’t really even use that to take the chill off. What to do…. Yum – that looks great – we used to make muesli in a student house which was delicious but the malt extract (I think) was a pain to use. E is going through a muesli phase so maybe i should try making some. RE your breakfasts, I am the type who needs breakfast or I am grumpy. I can recommend having some fruit around the house for the quick and easy breakfast when you have no time to prepare anything! I would rather have breakfast than lunch. Breakfast is my wake me up meal for sure. While I am having a cup of tea, I make a small pot of oatmeal. I use the ones that take 5 minutes to make. In my bowl while the oatmeal is cooking I chop of some fresh fruit, if I have it, or a nice handful of dried fruit and some chopped pecans. I add just a bit of brown sugar and a hit of cinnamon to make it not so boring and there you have it! It is warm and very filling. Holds me together until lunch! In the summer months is when I do cold cereal with fruit as it gets too warm down here for oatmeal during that season. These are weekday breakfasts, weekends is another story! Oh I hear you about the struggle to fit in time for a sensible breakfast during the winter months. That snooze button is just too tempting! I’m a toast person, wolfed down as I put on the washing machine/iron my shirt/dry my hair/search for my tube pass. Such a bad habit but I just hate weekday mornings! 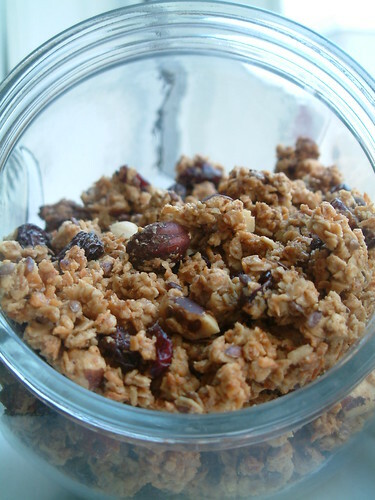 I’m better at weekends though so I may give this delicious-looking granola a try. Yum! Deb – “I’d rather have breakfast than lunch” – my! that’s some statement! Wish I had the drive to actually make porridge first thing. I’ve tried but I just can’t keep it up… It’s so good though. Antonia – Ah, the snooze button. Whoever invented it should either be hugged or shot. I love the sound of the cardamom and cinnamon in a breakfast treat. I understand fully the difficulty of getting up (especially when it’s a reasonable hour and it’s STILL dark). I’ve found something this year that’s helping, though. I keep my little bedside light on the floor (musn’t wake the husband, grumble grumble) but I’ve switched it to an energy saving lightbulb which warms up slowly and gently gets me to open my eyes rather than blasts me with light. It’s a small thing, but it’s helping. Welcome to Melissa’s Granola fun club! I love that you added brazil nuts. They are my favorite. I love that you add flax seed and diverse spices to your granola. Great photo too! I find breakfast so enjoyable. I make coffee, fruit and news on npr my morning ritual. I should add your granola to the mix! That look like the perfect way to start (or end!) the day Wendy! In the meantime, I’ve tagged you! Check out my latest post (http://helengraves.co.uk/?p=168). Helen. I’m not a granola kind of person – but I think I might have to give this a try! Great picture! The nice thing about granola and yogurt is that it’s easily portable! Just put some in a plastic cup and you can eat it at your desk if you don’t have time before you leave the house. Sounds and looks very tasty (nice picture there Wendy). I bet it would still taste fab with much, much less sugar, especially if you used a bit more dried fruit. Another trick is to use less sugar but coat the ingredients in apple juice before you cook them. I do a similar thing to Joanna – mix a couple of spoonfuls of the granola with yogurt and a grated apple the night before and leave it in the fridge, then you can have a whole 5 minutes extra in bed. Annemarie – Hmmm, like that idea. Might try it out. Joy – Sounds relaxing. I should get into that habit too. Helen – Thank you! Will save that for a rainy day/busy week. Sophie – There’s no way I could eat a whole bowl of this as it’s too sweet for me (though not for D who is munching a large bowl now). Assumed it needed that much sugar and butter to bind together? Replacing it with dried fruit would just create muesli, no? I’m a lunch-skipper, not a breakfast skipper. It seems you’re just the opposite. I have to have my coffee and something filling in the morning–I usually have oatmeal, especially on cold mornings. However, I’ve been wanting to experiment more with making my own granola. Last time I tried, I didn’t like it very much. This looks like a winner recipe though, and one that I can play with. Hang in there, spring and sunshine are on their way! Christina – I can’t skip either! My problem is that if I don’t eat breakfast at home then I turn to white toast and jam from the school’s breakfast club. Do love this granola but, I kid you not, it is sweet. Want to toy with it myself. There must be a way to make it bind with less sugar and butter. Granola is certainly making the rounds lately, I just made some too, but devoured it in no time and I need to make more! Wendy this sounds like a fabulous recipe! I can see myself eating eat by the handful. Delicious! Brilynn – Hello and welcome! Intrigued by your granola. The ingredients list is more wholesome. Wonder if it’d suit my unsweet-tooth better? Truffle – It was really fun to make, I have to say. And it’s great to nibble on!